The POWER-SAVE Unit is designed to provide significant savings on electric bills, increase the life of electrical motors through heat reduction and provide surge protection for the entire home or facility. Using methods employed at large industrial complexes, now reduced to a compact unit, the Power-Save reclaims and recycles electrical energy. The application has benefits to both the user and the supplier of electrical power. The POWER-SAVE Unit fine-tunes the electrical system in your home or office. This fine tuning reduces heat generation, reduces amperage and results in reduced consumption of electricity. It causes less waste of electrical energy while increasing the life of the inductive equipment in your home or office. It protects against power surges and increases the capacity to the electrical panel by making it run cooler. All this means extra $$$ in your pocket. All POWER-SAVE products are backed with a comprehensive warranty. Customers using the POWER-SAVE Unit have realized savings of up to 25% on their home or small business monthly power bills. This means less heat dissipating back into your living area, less drain on your air conditioning system, and less cost to you. In fact, up to 30% less money spent on air conditioning costs alone! In the wintertime, the Solar Attic Fan helps equalize the temperature between the attic inside and the outside air. This dramatically reduces the risk of ice dams forming at the eaves -- a feature that could save you thousands. The combination of these two devices can save you a lot. If you Fall and spring loading are 1000 kWh a month you can save more the 250 kwh with the Power Saver alone. 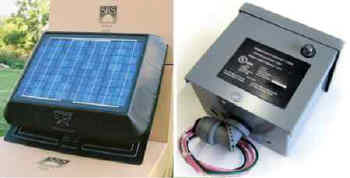 If your summer time cooling is an additional 2000 kWh then you will save 600 kWh with the Solar Attic Fan. and with both together you would save you would save around 1300 Kwh or 45%. -- Solar Vents must have sufficient under eaves vents (Sofit Vents) for full air follow to get best cooling of attic space.